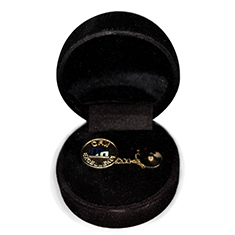 Corporate lapel pins can be manufactured without using expensive 10KT Gold or Sterling Silver. 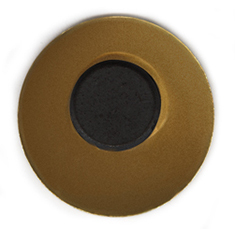 By using two-tone etching with industrial grade stones, these lapel pins can have an enhanced look. Packaging can also be upgraded to presentation boxes for a classy appearance. All Pins come individually wrapped in a plastic bag unless you request a Plastic Snap Box or Velvet Box. Choose between metal colours such as gold and silver, paint-fill options to add interest and color, sandblasted areas for a two-tone look, or add stones such as diamonds or rubies for a corporate look. 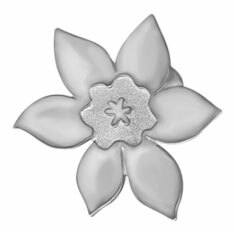 Custom lapel pin setup charges, including artwork and dies = $75. 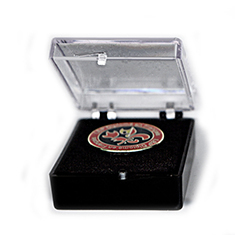 Corporate lapel pins are available in Gold, Silver, Bronze, Plating, and 2-tone etching. 5 colours are all inclusive in pricing. Plating colour quantities can be varied within the volume purchased. We do NOT accept hand-written text or verbal orders. Proof: You will receive an artwork proof prior to the production. We cannot make changes once you approve the artwork proof. Please allow 3 to 4 weeks for delivery after art approval. * Please view table on tablet or desktop, may be cut off on mobile. Please make sure to include all relevant information in your request. We will contact you by phone to confirm your order.